Today I was my 34th birthday. What better way to start a birthday than with a fun race in the morning? I ran in the XC12K for the third time and had some fun, along with some painful racing. The XC12K takes place every year on the first Saturday of August. I first became aware of it in 2013 when they put a flyer in the packet for the Race to Robie Creek. I ran it in 2013, 2014, then again this year (2016). One thing I love about it is that it’s only $25 if you sign up early! The ~8 mile course is pretty fun. It starts at Fort Boise then goes right into the foothills. The course has some steep uphill during the first four miles, then some steep downhill and a little uphill in the second four miles. Except for the first and last half mile, the course is all on a trail. There are some fun points where the hills and switchbacks let you see runners ahead and behind you. There are also four water stations, which are nice during the warm and dry August weather. I signed both Cyndi and me up for the 2016 XC12K. This meant we would need a babysitter, and fortunately my mom was able to come to our house at 6:50am so we could pick up our bibs and get ready before the 8am start time. I was excited for the race this year as I thought I had a chance at a top 3 finish. 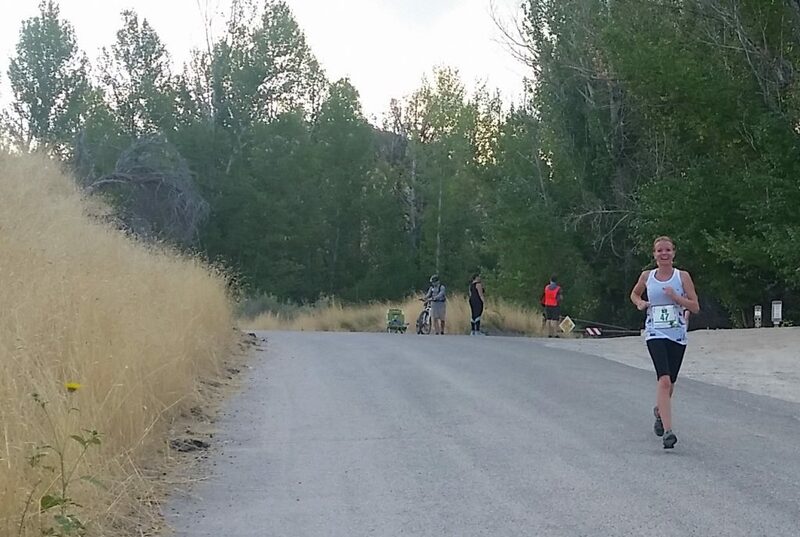 However, I was unsure of how I’d be able to perform after running the Morgan Valley Marathon last Saturday. I have never ran more than ~7 miles the Saturday after a marathon, and this race would require about 8 at full effort. Sunday and Monday I rested. Tuesday: 17 minutes on the elliptical followed by a 30 minute stationary bike ride. Wednesday: 30 minutes on my bike followed by a 1 mile light jog. Thursday: 4.75 miles with the first three miles progressively faster and the fourth mile pretty hard. It was a mix of recovery and speed. This was definitely the best I’d ever felt the week after a marathon, due in part to my 95% (rather than 100%) marathon effort and in part to being in better shape. I really didn’t hit the wall in the marathon so my muscles weren’t as shredded as usual. Packet pick-up before the race was fine. 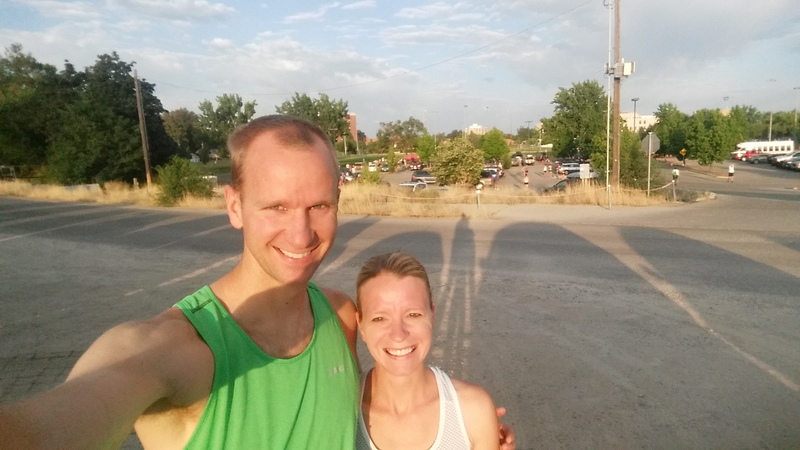 I did a little warm up and Cyndi and I snapped a pre-race photo. We lined up and started running at 8am. The start of the XC12K was really fast, as usual. I thought I could do the race anywhere from a 6:00 to a 6:40/mile average pace, but I knew the pace would be volatile due to the big hills. I could tell everyone was moving fast and my watch was showing ~5:40/mile pace. I tried to hang back a little, but I also didn’t want to separate too much from the lead group in this relatively short race. After about a half mile I was in about 10th place. However, I started passing a few people and runners especially slowed down once we hit the first big hill. On the hill I was able to get to 4th or 5th place. The top runners extended their lead and by the top of the first big hill before Mile 2 I could see that I was a couple hundred yards back. I settled into 4th place and the runners continued to spread out, including the space between 3rd place and myself. At Mile 2.5 there is a steep half mile hill, and I noticed that I gained some ground back on runner #3. I also noticed that my quads were really burning already, and it occurred to me that I haven’t done much hill training lately and I was going to pay for this. I figured the guys around me also had burning quads, so I should just keep going. There’s a nice section from Mile 3 to 3.5 that goes around a big hill while maintaining about the same altitude. I really enjoy this portion of the course and I was able to maintain or gain a little ground on the runner ahead of me. I also noticed that we were extending our lead from the #5 runner and beyond. Meanwhile, runners 1 and 2 were extending their lead on the rest of us. At Mile 3.5 there’s a really steep hill. I hit it hard and was able to move into 3rd place part of the way up the hill. I also felt like I was gaining on runner number 2. I was very relieved when the hill crested and the descent began. I was now half way and it was (almost literally) all downhill from here. I soon felt noticeable effects of my marathon the previous week. My legs, especially my quads, were much tighter than I expected and I was feeling a little weak and dizzy. I focused to stay on my feet and keep pushing the pace. It also got pretty warm as the sun was shining and the temperature was 68F at the start. In fact, runner #4 was still close behind me and I was scared he’d pass me. I tried to accelerate hard after any curves or uphill sections of the trail. I found my lead slowly, but surely, expanding as we crossed through Miles 6 and 7. I also found that any hopes of 2nd place were being dashed as the second place runner was getting pretty far ahead of me. Finally we were approaching the end of the race. The last time I checked I had a comfortable lead and I was relaxing a bit. With about 1/3 mile to go I sneaked a peek back and saw 4th place closing the distance and coming up fast. It startled me and I immediately kicked into my highest gear, running scared. I really wanted that $25! I checked again after 150 yards or so and saw that my kick must have demoralized his sneak attack as he had let up. I was very relieved that I didn’t have to fight any harder, and even more relieved when I could finally stop after crossing the finish line. My time was about 53:22, which works out to a 6:37 pace according to my watch. I’m not sure my watch was very accurate on the distance though, so my pace may have been slower than that. I really love the XC12K and look forward to running it in the future. I don’t do many trail runs, and they are generally more interesting than running on a road. I was surprised by the difficulty of the race this year. I really wanted to walk a few times, and the runner behind me didn’t let me take it easy on my pace. After shaking hands with the guys in front of me and behind me, I got some water and some post-race snacks. Then I started a slow cool down jog as I waited for Cyndi. I headed to my car to grab my phone and I was pleased to see my high school cross country coach, Tracy Harris. I hadn’t seen him in quite a while so it was good to catch up with him. I doubled back on the course and was able to get some good photos of Cyndi as she finished her race. Cyndi nearing the finish of the XC12K. This is at ~Mile 7.5, which is the only road portion of the course. Then we headed home where I could finish out my birthday with some presents, yard work, cake, free root beer floats at A&W, processing peaches from our tree, a BBQ, and a fun board game with Cyndi and friends. 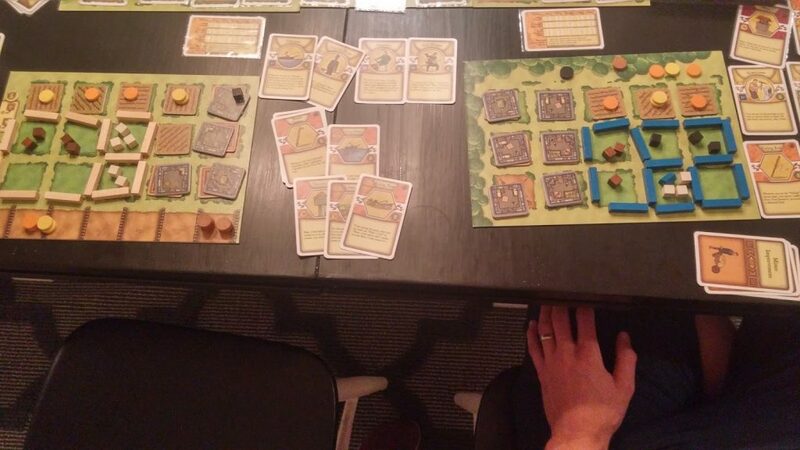 Cyndi and I finished in a rare tie in Agricola.